While some top British Olympians seem to be almost jockeying to get out of the Commonwealth Games, spare a thought for someone who really wanted to go but can’t. 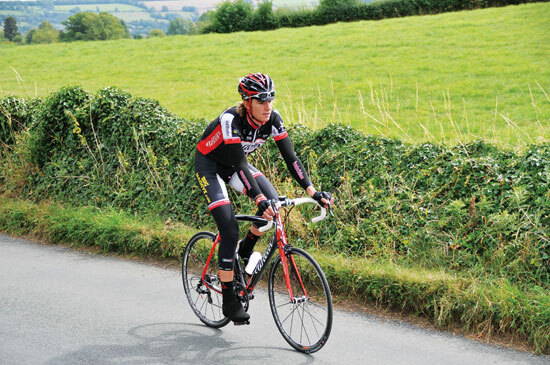 Matt Rowe is the older of two Welsh cycling brothers. After being part of British Cycling’s Talent Team and development programmes, Matt didn’t make it to the under-23 academy like brother Luke has, so with thoughts of a pro cycling career shelved, he went to university instead. “That was three years ago,” he says. “I graduated and the Commonwealth Games falling this year was perfect timing for me. I’m a bit different to Luke in that I always thought I would have to get a good education and a good job. Luke has always wanted to be a pro racer, and the way he’s going now, that looks like it’s the right choice for him. “But for a personal objective, something I could do in cycling before getting down to full-time work, the Commonwealth Games this year was perfect. I decided to have a gap year, so I spent last winter in Australia training 20 hours a week, then I crashed in the Irish Milk Ras and that was that,” he explains. I’ve picked Rowe up from his house on the outskirts of Cardiff and we’re driving to the Cotswolds, as he’s kindly agreed to ride some of the Bike Blenheim Sportive’s route for us. Talking about his Games ambitions on the way reveals how exhilarating, but also how heartbreaking top sport can be. “The crash wasn’t even my fault. I was in a line, going fast, and the guy in front of me kept looking over his shoulder and moving off line. I said something to him, he turned round to give me the stare and fell off. I hit him and that was that. I was off the bike for five weeks. “The thing was though, straight after being off I had to set some selection times, and I just couldn’t do them. I knew there was no way I could do them in the time allowed either, so I wrote an email to the Welsh selectors but I didn’t hit the send button for a few weeks. “I was in denial, I couldn’t let the idea go, but eventually I had to and hit the send button,” he tells me. Sounds like it still hurts too. Rowe is a former European junior scratch race champion and had a realistic chance of a medal. Once his fitness returned, Rowe won the national derny paced title, but his edge had gone. “I’m not riding the track nationals, in fact no more track this year. You need to do so much special training for it, and I can’t at the moment. I’ve been concentrating on the road,” he says. Today’s ride starts in Bourton-on-the-Water, a typically pretty Cotswold village that must be in every tourist book in the world because the streets and grassy stream banks are thronged with people. Rowe’s route echoes the sportive in that it’s a figure-of-eight based on nearby Stow-on-the-Wold. In the sportive the first loop is the 60-mile option and both loops make up the 100 miles. Rowe starts by doing part of the loop only the 100-milers cover, and is soon in deeply rural and very quiet lanes. “I like it. It reminds me of how I started cycling. My mum and dad [Rowe’s father Courtney is one of the key coaches at the Wales National Velodrome in Newport] are both cyclists. Some of my first memories are family holidays with me on the back of Dad’s tandem and Luke on the back of Mum’s. We went all over, even to France, and had some great times,” he remembers. Rowe parts company with the Blenheim route at Winchcombe, cutting cross-country to Broadway. This stretch runs along the flat land at the base of the Cotswold escarpment, but a route direction reversal from north to south-east means climbing 200 metres up past Snowshill Manor, a National Trust property that has a collection of vintage bikes inside. A long descent follows to Stow-on-the-Wold, which is on a hill so there’s a climb through town. 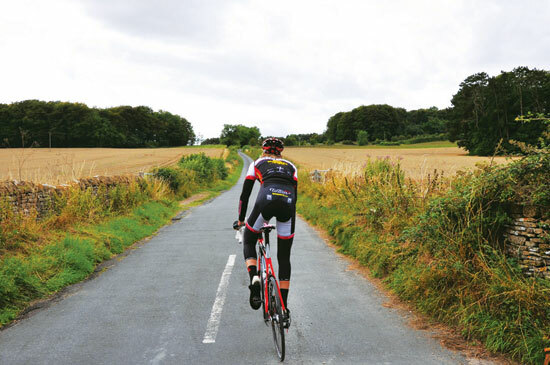 These roads are from the 60-mile sportive and first part of the 100-miler. Contrarily, though, we’re going in the opposite direction to the sportive. “That’s the thing about cycling though isn’t it? Independence, going where you want. I like racing, I like the track, which is disciplined, but I love the freedom of just riding my bike, especially with the group I ride with in Wales,” Rowe says. Rowe has reached the next phase of his career. He’s been part of big British teams like Rapha and Pinarello, now he’s happy in the more relaxed atmosphere of Ben Luckwell’s Wilier team. 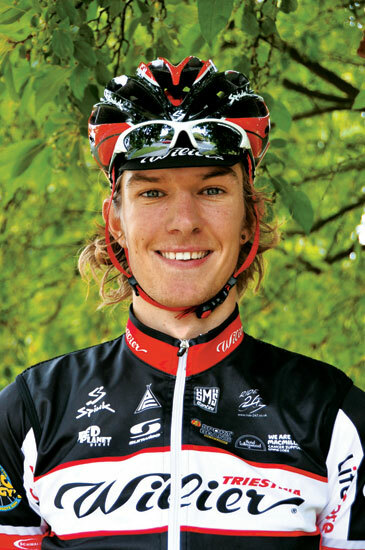 “Ben’s quite easygoing, and I think I fit into the team well with my strength of being able to ride hard on the flat. We were disappointed not to make the Tour Series this year though. We were in until the last minute, and I don’t know quite what happened,” he says. Start in Bourton-on-the-Water and cross the A429 into the lanes heading for Charlton Abbots. There’s a steep descent to Winchcombe, a descent you’ll climb on the sportive. The next bit runs alongside an old rail line, before the long pull from Broadway up a slope. It’s downhill most of the way to Stow-on-the-Wold, then uphill into town and down to Broadwell, where you enter the Evenlode Valley before an undulating ride almost to Charlbury. Turn right on the B4437, then take another right towards Shipton-under-Wychwood before following an unclassified road to Taynton (care crossing the A424), Great Barrington, the Rissingtons and back to Bourton.